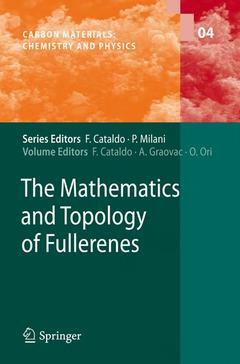 Mathematics and Topology of Fullerenes presents a comprehensive overview of scientific and technical innovations in theoretical and experimental studies. Topics included in this multi-author volume include: Clar structures for conjugated nanostructures, counting polynomials of fullerenes, topological indices of fullerenes, the wiener index of nanotubes, toroidal fullerenes and nanostars, C60 Structural relatives: a topological study, local combinatorial characterization of fullerenes, computation of selected topological indices of C60 and C80 Fullerenes via the Gap Program, 4valent- analogues of fullerenes, a detailed atlas of Kekule structures of C60. This multi-author volume is targeted at advanced graduates and researchers working in carbon materials, chemistry and physics. Harry KROTO: Foreword.- 1. Ali Reza ASHRAFI/Mircea DIUDEA/Ante GRAOVAC: Omega Polynomials of Fullerenes and Nanotubes.- 2. Ali Reza ASHRAFI: Wiener Index of Nanotubes, Toroidal Fullerenes and Nanostars.- 3. Mircea DIUDEA/A. E. Vizitiu: C60 Structural Relatives. An Omega-aided Topological Study.- 4. Istvan LASZLO/Reti TAMAS/Ante GRAOVAC: Local Combinatorial Characterization of Fullerenes.- 5. Ali IRANMANESH: Computation of some Topological Indices of C60 and C80 Fullerenes by GAP Program.- 6. Mathieu Dutour SIKIRIC/Michel DEZA: 4-Regular and Self-Dual Analogs of Fullerenes.- 7. Helena DODZIUK: Endohedral fullerene complexes and in- out isomerism in perhydrogenated fullerenes. Why the carbon cages cannot be used as the hydrogen containers?.- 8. Damir VUKICEVIC/Milan RANDIC: Detailed Atlas of KekulÃ© Structures of the Buckminsterfullerene.- 9. Ernesto ESTRADA: A Graph Theoretic Approach to Atomic Displacements in Fullerenes.- 10.E.C. KIRBY/R.B. MALLION/P. POLLAK: Counting Spanning Trees in Toroidal Fullerenes.- 11. O.ORI, F.CATALDO, A.GRAOVAC: Topological Determination of 13C-NMR Spectra of C66 Fullerenes.- 12. Giorgio BENEDEK: The Topological Background of Schwarzite Physics.- 13. Haruo HOSOYA: High -Electronic Stability of Soccer Ball Fullerene C60 and Truncated Octahedron C24 among Spherically Polyhedral Networks.- 14. Patrick W. FOWLER/A.GRAOVAC: The Estrada Index and Fullerene Isomerism.